The crew from the Travel Channel show "Food Wars" will be in town for the next few days filming an episode of the show. 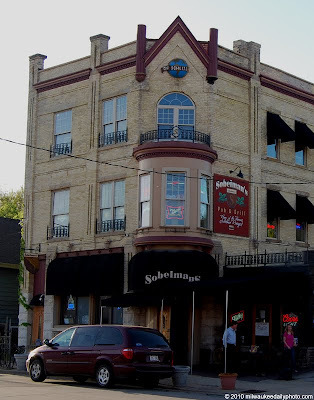 The contest will name Milwaukee's Best Burger, and the combatants are Sobelman's (shown above) and AJ Bombers (which has been featured in previous posts). Best of luck to both teams, and may the best burger win! Nice to see that Milwaukee's burger scene is getting some national attention - but unfortunately the legendary Mazo's is being overlooked as usual. Despite numerous accolades, and the fact that they grind their own beef (!!! ), these incredible burgers still get missed. Maybe the south side location just isn't "hip" anymore?